Apple is the most important temperate fruit of the northwestern Himalayan region in India. It is predominantly grown in Jammu and Kashmir, Himachal Pradesh and hills of Uttar Pradesh, accounting for about 90% of the total production. Its cultivation has also been extended to Arunachal Pradesh, Sikkim, Nagaland, and Meghalaya in north-eastern region and Nilgiri hills in Tamil Nadu. The agro climatic conditions in these states are not as conducive as in north-western Himalayan region. Early and continuous rains from April onwards do not favour the production of quality fruits besides resulting in high incidence of diseases. The apple-growing areas in India do not fall in the temperate zone of the world but the prevailing temperate climate of the region is primarily due to snow covered Himalayan ranges and high altitude which helps meet the chilling requirement during winter season extending from mid-December to mid-March. Well distributed rainfall of 100-125 cm throughout the growing season is most favourable for its optimal growth and fruitfulness. The long drought spells during fruit development and excessive rains and foggy conditions at fruit maturity hamper fruit size and fruit quality. Dry temperate areas suitable for apple cultivation in Himachal Pradesh and Jammu and Kashmir are most suitable for production of high-quality fruits having intense colour development, high sugar content and longer shelf-life. Soil depth, drainage and pH determine the suitability of soil types. Loamy soils, rich in organic matter having a pH of 5.5-6.5 with gentle to moderate slope, proper drainage and good aeration are most suitable. The soil should be free from hard substrata and waterlogged conditions. Where cultivation is done on flat soils, proper drainage channels need to be developed to restrict the incidence of collar rot, root-rot and other soil-borne diseases. Table2. High-colouring and early and early-maturing sorts of apple. Recently, a further shift form Delicious group to improved spur types and standard colour mutants has been observed. The spur-type mutants produce trees 50-80% of the standard size with 20-50% higher yield potential in addition to early fruit maturity and better fruit colour. The, colour mutants produce standard sized trees with early and better fruit colouration. Some of the promising high colouring and early sports of Delicious group identified for cultivation are listed in Table2. 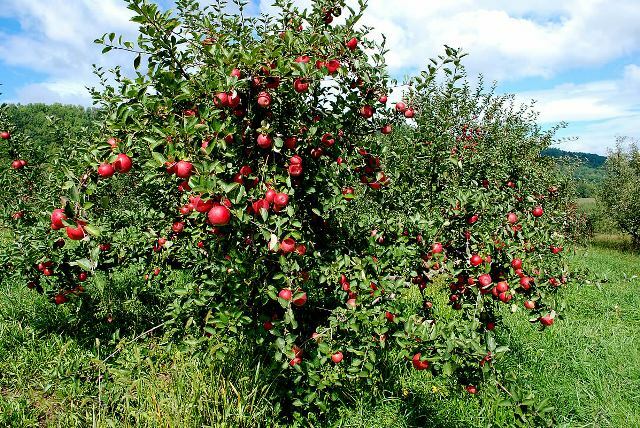 The high-yielding apple Scarlet Gala and Red Fuzi have also been introduced in Himachal Pradesh and hills of Uttar Pradesh. These are being evaluated on size controlling clonal rootstocks M 9, M 26, M 7, MM 106 and MM111. A number of scab-resistant cultivars have been introduced since the incidence of apple scab in epidemic form in 1972-73 in Jammu and Kashmir and 1879-79 in Himachal Pradesh. These introductions include Prima, Priscilla, Sir Prize, Jon free, Florina, Mac free, Nova Easy Grow, Coop 12, Coop 13 (Red free), Nova Mac, Liberty and Freedom. Florina, an introduction form France, has shown promising performance in Himachal Pradesh and may become a good substitute for Delicious apples in scab-prone areas. Firdous and Shireen have been released for commercial cultivation as scab-resistant varieties in Jammu and Kashmir. Hybridization programme of apple resulted in release of Lal Ambri (Red Delicious x Ambri) and Sunehari (Ambri x Golden Delicious) in Jammu and Kashmir; Chaubattia Princess and Chaubattia Anupam (Early Shan burry x Red Delicious) in Uttar Pradesh hills; and Ambred (Red Delicious x Ambrich (Richared x Ambri) and Ambroyal (Starking Delicious x Ambri) in Himachal Pradesh. Ambrich, Ambroyal and Ambred have not gained popularity among the growers of Himachal Pradesh because of very late maturity and extended harvesting period, whereas high-colouring and early-maturing cultivars are preferred. These varieties perform well in areas where winter chilling is less than 800hr below 7 C, insufficient for breaking dormancy of Delicious varieties. Introduction of low-chilling varieties has expanded the scope of apple cultivation to warmer and marginal areas. However, all low-chilling varieties are poor in dessert quality, subacid in taste and have poor shelf-life and as such have a scope for commercialization. Important table-purpose, low-chilling varieties are Michal, Schlomit, Anna, Tamma, Vered and Neomi. Tropical Beauty and parlin’s Beauty are suitable for processing purposes. The most important feature of a pollinizing variety is that its flowering should synchronize with the main variety. In addition to this, it should have abundant viable pollen, long duration of flowering, compatibility with main variety, self-fruitfulness, regular bearing besides good commercial value. The Delicious group of varieties are self-incompatible and cross-pollinated, whereas most of the English varieties are self-pollination and act as suitable pollenizer for Delicious group of varieties in the proper proportion of 11-30% in main variety plantation depending on the situation of the orchard. The most suitable pollinizzing cultivars are Tydeman’s Early, Red Gold, Golden Delicious, McIntosh, Lord Lambourne, Winter Banana, Granny smith, Stark spur Golden Spur. A combination of early, mid-season and late-flowering pollinizers provides assured cross-pollination for the main variety. A combination of Tydeman’s Early, Red Gold and Golden Delicious has been recommended in Himachal Pradesh for Starking Delicious plantations. The flowering crabs have varieties are Red Flush, Crimson Gold, yellow Drop, Manchurian, Snowdrift, Golden Hornet and Malus Floribunda. Red free and Liberty, resistant to scab, can also be used as pollinizers. The apple plantations are raised on seeding rootstocks. The used of clonal root stocks has not been commercialized despite the established superiority for raising uniform plantations, precocity and high productivity in Himachal Pradesh, Jammu and Kashmir and Uttar Pradesh. Non-availability of clonal material in the absence of commercial mass propagation techniques has remained the major constraint. Apples are propagation on seedlings of crab apple or self-pollinizing varieties, Golden Delicious, McIntosh, Yellows Newton and Northern Spy having good seed viability, germ inability and seedling growth. The seeds of commercial varieties from fruit juice canning units are also used by nurserymen for raising seedling stocks. However, the seedling stocks lack uniformity in tree size and productivity but show better adaptability to sloppy and shallow soils under rain fed conditions. Apple seeds need stratification in moist sand at 4 -7 C for 60-90 days. The water-soaked seeds are placed between 2 and 3 cm thick layers of moist sand in wooden boxes or polythene bags during December. The stratification boxes or bags are placed in cool place where the required chilling temperature of less than 7 C for 1,000-1,500 hr is met in 60-90 days. The sand is kept moist during stratification. The stratification can be accomplished in the lower chamber of the refrigerator also. The stratification requirement is also met with in areas having very cool winters by direct sowing of seeds in nursery beds during November-December. The pre-stratified seeds, as indicated by whitish tip at the micropylar end, are sown during February-March in well-developed, raised beds. Sowing is done in rows 10 cm apart with the spacing of 5 cm between the seeds and 2-3 cm deep. Nursery beds should be irrigated after sowing and covering with 10 cm hay or pine needle mulch to protect the germinating seedling from heavy rains and spring frost. Mulch when the seedlings are 5 cm long for the straight upright growth of seedlings. One-year-old seedling stocks are ready for grafting during February-March. The size controlling Malling (M) and Malling Merton (MM) series clonal rootstocks were introduced at the Regional Horticultural Research Station Mashobra and Temperate Fruit Research Station, Kotkhai, in Himachal Pradesh, Government Hill Fruit Research Station, and Chaubattia in Uttar Pradesh and Fruit Research Station, Shalimar in Jammu and Kashmir during late sixties. The size-controlling clonal rootstock of apple is mound layering (stooling). The rooted layers of the clone are planted in well-prepared stool beds during winter at a distance of 30 cm in the row and 60 cm apart. The 3-4 years old layers give rise to numerous suckers during spring. The suckers are covered with the soil before monsoon. The suckers are ringed or notched near the base during the rainy season and covered with soil to encourage rooting. The difficult-to-propagate rootstocks like M 9 need the treatment of 1,000-2,000 ppm IBA at the notched portion for quick root initiation. The rooted layers are separated t the onset of dormancy (December) and lined out in nursery beds for further grafting with scion varieties during February-March. The rootstock should be healthy and disease-free and should attain the thickness of 0.9-1.25 cm at grafting eight for proper bud-take success. The growth of the rootstock should be straight and upright with proper root development. There should be no gall, knot or injury scar at the grafting height. The rootstocks of apple are grafted with desirable scion variety during February-March. The scion wood should be collected fro, the mother plants of known pedigree. It should be collected from bearing trees only. One-year-old shoot growth is ideal for scion wood. Scion sticks should have only vegetative buds and not the reproductive buds. The scion wood should be healthy and disease-free. They should have 3-5 well-developed buds with smooth internodes. These should be collected during dormancy. The scion wood collected prior to grafting must be properly stored. It should be kept slightly moist and at a low temperature to prevent the bud-break. A common method is to wrap the wood, in bundles of 25-100 sticks, in polythene sheets or bags. Moist saw-duct. Wood shavings or moss should be used for packing to maintain moisture during storage. Sand should be avoided as it sticks to the scion wood and blunts the edge of knife during grafting. The storage temperature is also very important. If the scion wood is stored for 2-3 weeks, 5 C storage temperatures is satisfactory. However, If the scions are to be stored for a longer duration (1-3) months), the scion wood should be kept at about 0 C to keep the buds dormant Scions cannot be used for grafting in the active stage of growth. Tongue grafting is the ideal method of grafting scion cultivar on the rootstock with more than 90% bud0take success. The scion should be grafted 15-20 cm above the ground level. February-March is most suitable time of tongue grafting. It should be just before the bud-break. In tongue grafting, a slant cut is made on the rootstock 2-3 cm ling across the stem about 15-20 cm above the crown. A vertical cut is given from one-third of the top of slant cut and extended up to two-thirds of the length of slant cut. Similar cuts are made on the scion wood and the 2 parts are connected by inner locking the tongues made by vertical cuts on scion and stock. The cambium of the 2 portions should match for successful graft. The graft union is wrapped with polythene wrapping should be removed. “T” budding during monsoon and chip budding during August can also be done for propagating scions with good bud-take success and smooth scion-stock union but the plant growth is poor in the Indian conditions. It takes one year for raising grafted plants, whereas two in case of budded plants of standard size. The combination of rootstock and scion variety determines the planting distance and planting density. In standard plantations, the plants of standard varieties grafted on seedling stocks are planted at a distance o f6-7.5 m, accommodating180-250 plants/ha. The planting distance can he reduce according to the vigour of rootstock? The clonal rootstocks particularly dwarfing and semi-dwarfing root stock should be used where the soils are flat, fertile and irrigated. High-density planting has consistently increased in popularity and acreage particularly with small land-holding in the Indian conditions recently. The traditional systems of planting having long juvenile period are labour-intensive and low-yielding with poor-quality fruits, whereas high-density planting is more efficient orcharding system. It is precocious, easily manageable, has higher yield potential, with better quality fruits and higher returns/unit area. The high-density planting cannot be adopted in very steep, unfertile, shallow and drought-prone areas. The trees of high-density plating should have maximum number of fruiting branches and minimum number of structural branches. The branches on the tree should be so development that each branch casts a minimum amount of shade on other braches. To develop favourable characteristics,, following rules must be followed.
. Develop fruiting spurs along the sides rather than top or bottom of lateral branches. A key to successful high-density planting depends upon control of tree size Following tree size controlling methods can be adopted to develop high-density plantings. The most convenient and indispensable method of tree size control in apple high-density planting is the use of size controlling clonal rootstocks. The combination of rootstock and scion variety determines the plat spacing and planting density/unit area. The recommended planting density and spacing are given in Table 4. The plants are trained according to growth habit and vigour of the rootstocks. Training helps to establish a strong framework of scaffold limbs capable of supporting heavy yield with quality fruits, regulate annual succession of crops, expose maximum leaf surface to the sun, and direct the growth of the trees so that various cultural operations like spraying and harvesting become economical, protect the trees from sun-burn and promote early production. The training procedures for standard and dwarf plants differ. The plants are pruned to 50-60 cm above the ground at the time of planting. Above the ground and others spaced vertically 10-15 cm apart in a spiral fashion. The growth of the unwanted shoots is depressed by pinching 3-5 cm of the shoot tips during mid-April-mid-May. The selected primary scaffolds during summer are headed back to one –fourth to one-fifth of the growth. During second year dormant pruning, the central leader and primary scaffold branches are healed back similar to first dormant pruning. More scaffold branches are retained on the trunk at the vertical distance of 45-75 cm. A total of 5-7 secondary branches/trees usually two on each primary scaffold re also selected in the second dormant pruning which are directed partially out ward. The primary scaffold should have the crotch angle of 45 with trunk. The proper crotch angle can be developed by typing the branches with ropes or inserting the branch spreaders. Third year training consists of thinning of unwanted branches and heading back others to desirable side limbs. Secondary branches often develop spurs during third growing season. By fourth year, training is largely completed. By this time, the proportional growth of central leader and side scaffold branches should be attained which should be 1:1.5. This will help in lateral growth rather than upward growth of plants favourable for proper spur development. When the tree attains the height of 4-4.5 m, the central leader should be headed back near to moderate side growing shoot to check the height of the plant. Dwarf plants are trained to spindle bush/slender spindle, i.e. one-year old plant is headed back to 45-60 cm at time of planting. During first summer, 2-3 laterals or feathers, 30 cm from the base are selected to form main scaffold branches. The scaffold should have wide angle and be well-spaced around the stem. Vigorous growing laterals are tied down in August when the extension growth has ceased in order to develop wide crotch angle. During first summer, 2-3 well-spaced laterals are retained and unwanted branches are removed. The scaffold branches are headed back to one-third to half of the length to a outward growing bud if the growth is weak. Otherwise the main branches can be left un pruned. The leader is also cut back to more or less erect but a weak lateral. Any vigorous, upright shoot, growing near the forming leader and competing with it should also be removed. During August of second year, suitable laterals are tied down to form more scaffold branches. To check excessive vigour of central leader, it may again be cut back to suitably placed weak growing lateral which is trained to take the place of the central leader. Delaying pruning until late winter also helps in checking vigour. During subsequent winters, branches are allowed to grow from central leader at regular intervals, choosing wide angled shoots. Higher placed branches should be kept shorter than lower ones to allow the light penetration into the lower tree canopy to the maximum extent. The main branches should be so trained and spaced that there is plenty of room for fruiting laterals and those should not be allowed to fork at terminal. In order to keep sufficient wood in the spindle bush while it is being built up, a small surplus of wide angled branches is retained, which may be cut when branches require more space and get crowded. Start pruning at the top of the trees and work and work downward. Cut upward growing limbs back to strong laterals. Remove the crowding branches and thin out the remaining leaving the vigorous fruiting wood well spaced along the length of limbs. Remove dead, broken and diseased wood. Remove parallel growing shoots causing crowding and shading and opposite growing shoots at a point on the stem. Remove all water sprouts except the occasional ones which may be needed to fill a vacant space in the canopy. While removing a thick branch, first small cut should be made on the under side of limbs to avoid bark peeling. Divert branches to open areas by pruning to desirable laterals. Once the central leader has reached its desirable height of 2.5 m, the extension growth should be cut back each year to a weaker side branch. Strong growing shoots towards the top of the tree should be removed completely. Renewal pruning of the fruiting branches lower down should be carried out each year to maintain vegetative growth and fruit quality in lower part of the tree. The branches causing shade to the other lower branches should be removed or headed back. In thinning out of branches to main stem, a stub should be left to encourage the re growth of moderately vigorous fruitful bud. Avoid removing too many branches and so reducing potential fruit yield. The main branches which have lost the vigour can be stimulated by pruning. Worn out wood of heavy cropping varieties should be removed periodically. When a limbs larger than 3 cm in diameter is removed, the pruning cut should be made as close as possible to the branch from which the limb arises without leaving a stub. Large pruning wounds should be protected with Bordeaux paste or Chaubattia paste to check the entry of rot-causing fungi. In 1-or 2-year-old shoots, heading back can be done to promote growth of side shoots and quick wound healing. In 3-year-old and older shoots, pruning should be shifted to thinning out cuts to reduce veg3etative growth and promote fruiting. The competing branches should be thinned out rather than headed back. In an orchard of optimal fertility, N, P and K may be applied in the ratio of 70:35:70/ year age of the tree. The dose should be stabilized (700:350:700 g N: P: K/ tree) after 10 year of age. These applications may be supplemented with farmyard manure @ 10 kg/years age of the tree with the maximum of 100kg. Apple trees prefer N, P and K in the form of calcium ammonium nitrate, super phosphate and muriate of potash respectively. As the crop load is low in an ‘off’ year, the standard fertilizer dose of NPK may be reduced to 500g, 250g and 400g respectively. Since the response to P application is poor in P-rich acidic hilly soils, it would be a better practice if P is applied after every 2-3 years or should be reduce to half annually in such conditions. In bearing trees, farmyard manure along with P and K should be applied during December-January. Nitrogen is applied during February-March, 2-3 weeks before bud-break. The N can be given in two split doses, first 2-3 weeks before bud-break and second one month after flowering, where the irrigation facilities are available. The fertilizers should be broadcast in the tree basins 30 cm away from tree trunk to the canopy drip line and mixed well in the soil. Deep cultivation to mix the fertilizer in soil should be avoided, as this practice injures root system. In high-rainfall areas with steep slopes and small basins band application of N is preferred. There are deficiencies of macro as well as micronutrients. The B, Zn, Mn, Ca and N have been found in deficient range mostly and symptoms can be easily identified on leaves or shoots. The symptoms and corrective measures of important nutrient deficiencies are given in Table 5. Clean basin management is the common practice of floor management in apple. The basins are kept clean by hand working, hay mulching or black alkathene mulching. In cool climates, black alkathene mulch is very efficient which not only controls weeds and conserves moisture but also improves the fruit quality. It should be avoided in warmer areas, as black alkathene absorbs the solar heat and increases the soil temperature, hampering root growth. Application of Glyphosate @ 800ml/ ha or Grammaxone/Paraquat (0.5%) as post-emergence herbicide suppresses the weed growth for 4-5 month. In the initial years of plantations, green-manuring crops like sunflower and bean may be cultivated between the basins to improve the soil. Improved grasses like orchard grass (Dactyl is glomerata), tall fescue (Fescue arundinaceae) and timothy (Phleum pretense) and nitrogen-fixing legumes like red clover (Trifolium repens) and Lucerne (Medic ago sativa) can be introduced between the tree basin spaces in grown-up orchards. Heavy bearing in apple usually results in small-sized, poor-quality fruits and sets in alternate bearing cycle. Judicious fruits thinning at proper stage of fruit development not only regulate cropping but also fruits size and quality. The practice is essential in pollinizing. Carbaryl or Sevin @ 750-1,000ppm or NAA @ 10-20 ppm at petal fall results in optimal fruit thinning. Hand-thinning can also be done but it is very cumbersome and uneconomical procedure. Most of commercial varieties experience 3 phases of fruit drop-early drop, June drop and preharvest drop. The early drop considered natural, occurs due to lack of pollination and fruit competition. The June drop is caused by moisture stress and environmental conditions which can be checked by maintaining soil moisture through irrigation or mulching. The preharvest drop cause serious economic losses, as the mature marketable fruits abscise before harvesting due reduction in level of auxinus or increase in ethylene levels in fruit. Early-ripening varieties like Tydeman’s Early, Red Gold and Pippins experience 40-60% drop, whereas in Delicious group loss occurs to the extent of 15-20% of crop load. Application of NAA (10 ppm) before the expected fruit drop or 20-25 days before harvesting checks the preharvest fruit drop effectively. Most of apple orchards in India are situated in rain fed sloppy areas where irrigation facilities are inadequate except in flat valley areas. Apple requires uniform distribution of rainfall throughout the year or needs to be supplemented with irrigation during critical periods. The most critical period of water requirement in apple is from April to August, the peak requirement being after fruit set. In areas where irrigation is available, apple requires about 114 cm water during the whole year which can be scheduled in 15-20 irrigations. In critical summer months, the irrigations can be given at 7-10 days interval and rest at 3-4 weeks interval. At least 8 irrigation during critical period of water requirement are recommended for Starking Delicious apple. With the introduction of drip irrigation system, irrigation can be extended to scarce water source areas and hilly slopes also. About 1,695 litres of water/tree is required during the season in drip irrigation compared with 3,840 litres/tree in the conventional method of irrigation. In drought-prone and water-scarce areas, the soil moisture can be retained by hay mulching or black alkathene mulching immediately after spring rains. All the fruits do not mature evenly on trees depending on the time and number of flower flushes. Thus more than one picking are required. Apple fruits should be picked in such a way that bruising and stem punctures are avoided and pedicel must remain with fruit. Apple should be grasped between index finger, middle finger and thumb, and quick upward twist of wrist will easily pluck the fruit along with pedicel. Picked fruit should be placed softly in the picking bags or baskets. The fruits should be transferred carefully from picking baskets to boxes or baskets be transported to packing houses for grading and pacing. After picking, the fruits should be placed in a cool and ventilated place to remove field heat before packing. Air cooler, cold water sprinkling or fruits washing with water also helps quick removal of field heat. Keeping fruits over-night near the tree basins for cooling down is another practical way to remove field heat. Fruit surface must he free of moisture before grading, wrapping or packing in cartons. Apples are packed in wooden boxes. Size of wooden boxes used in different apple-growing areas of India is different and carry about 10 kg or 20 kg fruits in a box. Standard-sized wooden boxes are 45.7 cm long, 30.5 cm wide, and 25.4, 27.5 and 30.5 cm in height according to size of grade. Corrugated-fibre board (CFB) cartons are also available for packing apples. Such cartons are of 2 types-universal cartons and telescopic tray-pack cartons. The CFB cartons not only save the precious wood and forest wealth but result in very less fruit bruising (3.5%) which fetch good market price. The usual dimensions of CFB cartons with trays are 50.4 cm x 30.3 cm x 28.2 cm (outer jacket) and 50.0 cm x 30.0cm x 28.2 cm (inner case). Apples have a longer storage life compared to other fruits. However, different varieties have different storability. Deterioration of fruits starts after climacteric stage. However, shelf-life of apples can be prolonged by prolonged by providing optimal storage conditions. The cold storage retards fruit deterioration and reduces decay from pathogens and shrivelling from water loss. The recommended storage temperature for apple is -1.1 -0 C which is about 0.8 -1.8 C above the average freezing pint of most apple varieties. The relative humidity of 85-90% should be maintained in cold storages. Most apple varieties can be stored for 4-8 month after harvesting Ambri has the longest storage life. Scald is one of the storage disorders in apple. Light mottling on greener surface of fruits are initial symptoms of scald. Darkening become more severe with elapsed time and ultimately extends to red surface also. Scald usually affects the skin only but in sever cases it may extend to fruit flesh. The immature fruits are most susceptible to scald which is aggravated by warmer temperatures in storage. Bitter pit is characterized by small sunken spots on the fruit surface which are more prevalent near the blossom-end. Initially small water-soaked areas appear which shrink and turn brown with the loss of water and ultimately become brown localized areas of the dead tissue. Unlike the name, these corky tissues are never bitter in taste. The immature picked fruits and large-sized fruits in ‘off’ year are most affected, Golden Delicious, Yellow Newton and Graven stein being most susceptible apple varieties. Internal browning is associated with apple Yellow Newton and is characterized by brownish streaks radiating into flesh from the core. Controlled atmospheric storage with higher temperature can be helpful to control this disorder. Appearance of disorder is less at 1 C in cold storage.